The ground floor ‘Riviera’ Auditorium has a floor area of 1,100 m² and can hold between 200 to 1,000 people. 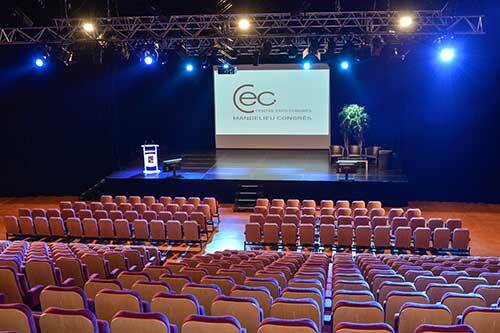 It has a stage area nearly 100 m² and is fully fitted out with professional sound, light and video equipment. Entirely renovated in 2013, the stands have plum-coloured seats. Thanks to the fully retractable stands, which are completely modular, it can also be arranged to accommodate trade fairs and dinner shows. 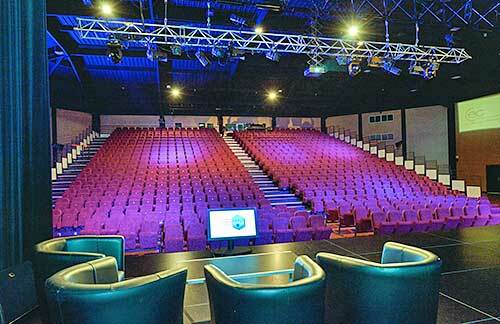 As with all the function spaces in the Congress and Exhibition Centre, the ‘Riviera’ Auditorium is modular and can be adjusted to your requirements. The main stand is retractable and the entire area can be arranged to accommodate between 200 and 1,000 people. It can be supplemented by two side stands and by chairs on the floor. It can be supplemented by two side stands each with 61 seats and by chairs on the floor to seat a total of 1,000 people. 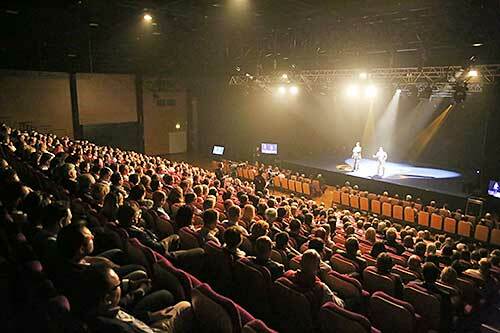 As with all function spaces in the building, the stage area can be adjusted according to your requirements. The stage opening is 12 metres wide and its depth ranges from 5 to 8 metres. The stage is 1 metre in height but gantries can be lowered to create a 40, 60 or 80 cm centre-stage. has a floor area of 1,100 m² and can hold between 200 to 1,000 people., light and video equipment. It has a stage area nearly 100 m².